I tend to spend a lot of my time in bare feet and shorts when I’m around the house, so my feet are mostly out of shoes and in the Summer time I tend to wear flip-flops. However, over many years of wearing shoes and trainers, I started to notice that my toes were tucking in behind the next toe and it had become their default position regardless of whether or not my feet were in a shoe or not. Having a few wonky toes isn’t a big deal and probably won’t impact your health… or will it? Well, it’s not going to kill you but if you are suffering from any posture issues, back pain, hip pain or knee pain then it may be worth looking into. 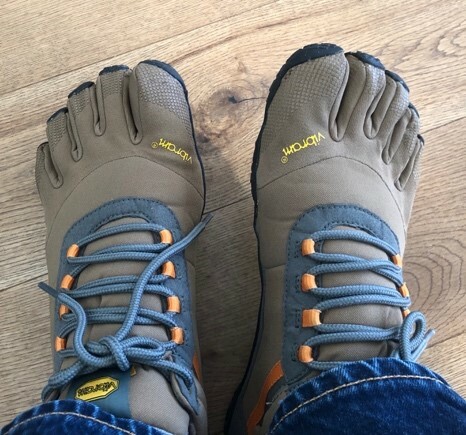 I was kind enough to be gifted a couple of pairs of Vibrams at Christmas and whilst they may look a little weird, they are incredibly comfortable. The one on the left is the ‘EL-X Mens Grey Black’ and the one on the right is the ‘Trek Ascent Insulated Mens Khaki’. As you can see from the pictures above, the shoes look like they are gloves for your feet. This enables your toes to be naturally spaced out. They do take a little while to get used to, especially to get onto your feet but after a couple of days it feels so natural and comfortable. When you walk, you’re able to feel all the bumps and lumps in the ground beneath you but it doesn’t hurt because of the padded sole. Now, Mrs P isn’t a fan and there is no way I am going to get her in a pair but I’m lucky enough to be allowed out of the house with her with them on. I think they look kind of cool. In addition to my Vibrams, I also have a couple of pairs of Vivobarefoot – these shoes look a little more ‘normal’ but have a wider toe spacing to prevent your feet from being scrunched up. Human optimisation is usually associated with cognitive performance, managing emotions or unlocking energy. Now you can know you can also optimise your feet.